We’ve come a long way since the days when Sid Meier’s Civilization was the only 4X ("eXplore, eXpand, eXploit, and eXterminate") game on the block. Now there are variants covering everything from specific slices of world history to the vast reaches of space – and space is the place to be, in my estimation. Indeed, Sins of a Solar Empire: Entrenchment was one of my honorable mentions following our first-ever Game of the Year awards back in 2009. But what’s best about Stellaris is its flexibility in both customization and playstyle, and the organic storytelling that arises as a result. I’ve bled out many hours playing as arachnid religious fanatics, sentient amanita mushroom slavers, cunning avian traders and, yes, even boring old human beings. Stellaris shares its lineage with the Paradox-developed Crusader Kings series, and while the galactic map doesn’t get as ridiculous as its Terra-bound cousin, you’ll find that the game’s random events – scripted and not – add unexpected twists and wrinkles to your experience. Being conquered by another empire doesn’t mean the game is over: you’ll want to go on for just one more year to see where it takes you. Just try to make sure that extra in-game year doesn’t keep you up to the wee hours of the morning. 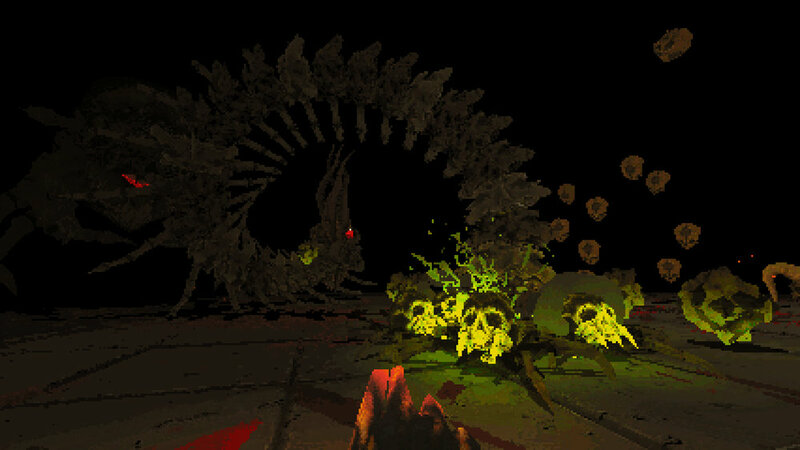 If the latest Doom is an example of a classic series grasping for modernity, I’d say that Devil Daggers is a modern indie game trying to capture the best aspects of early first-person shooters. In doing so, developer Sorath has succeeded in distilling the genre to its base essence: there’s one stage, two attacks and endless swarms of enemies. There’s not much more to it than that. That’s not to say that Devil Daggers is a reduction – indeed, you’d be hard-pressed to find a purer or more challenging shooter. On your first try you’ll be lucky to live past 10 seconds. You’ll get further and further as you make effort after effort, only to discover one of your Steam friends survived an astonishing ten seconds longer than your best time. And that’s the hook. I’m not a competitive person, but I devoted no small amount of time to Devil Daggers just to try to top Nick’s score. Well, that, and I wanted to see what fresh horrors arise as the game drags on. With its jagged, Quake-esque graphics and pitch-perfect audio, Devil Daggers might have made it onto our list in a different year. But the 2016 revival of first-person shooters saw us inundated with spectacular shooters of every facet – a full four of our top 10 games this year are FPSes. Though it was drowned out amid a field of other superb examples of the genre, if you like a challenge or a trip down memory lane Devil Daggers is definitely worth a play. Back in 2013, I wrote about Pokémon X and Y in extremely glowing terms. I continue to stand by my piece, but it was written with a certain flawed expectation: that X and Y were the pinnacle of the series. While Pokémon’s sixth generation iterated well on the franchise’s formula, in retrospect they fit the cookie-cutter mold of previous games to a T.
By contrast, Sun and Moon manage to feel truly fresh, going well beyond the graphical polish of previous generations. The latest games shake the formula up by emphasizing a more narrative-driven story and less mechanically focused play style than their predecessors. They are the easiest Pokémon games to get into, ever, with one of the most fleshed-out mid- and post-games you’ll find in the franchise. And they are probably the prettiest games on the 3DS, to boot. If you’re an old hand at the games, Sun and Moon are a gimme. If you’re new to the series, there’s no better time to jump in. I’ve described Thumper as a game that “makes you feel fear,” which is pretty accurate. A friend on Twitter called it a “persistent dread simulator,” which is also spot-on. In totality, Thumper is a completely brilliant rhythm game that uses the conventions of the genre in such a way as to create something shocking and unsettling without stooping to vulgar imagery or rote edginess. Thumper is my most heartfelt recommendation from this year’s crop of games. I know that many people won’t care for it, which is a shame. However, you might just be one of the people who really does get into the rhythm, and I hope so, because it’s a twisted, bizarre little game that’s very deserving of love. Thumper is all about how it makes you feel. You may not like how it makes you feel, but I recommend at least trying it out because there’s nothing else like it.